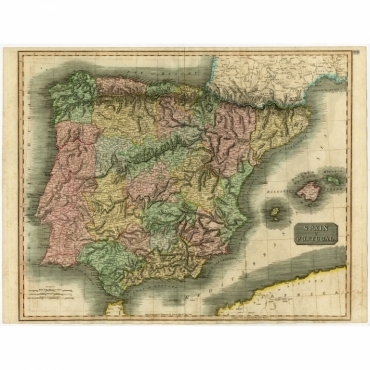 Antique maps of Southern Europe. This region of Europe is also known as Mediterranean Europe. 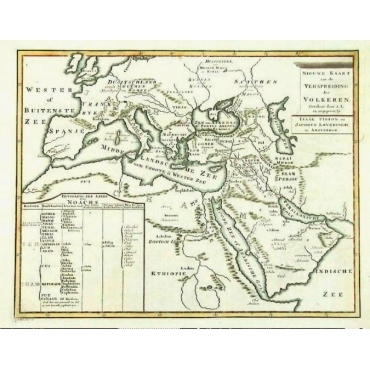 Our collection of antique maps of South Europe includes antique maps of Greece, antique maps of Spain, antique maps of Portugal, antique maps of Italy, antique maps of Turkey, antique maps of Cyprus and other regions of Southern Europe. Antieke kaarten van Zuid-Europa. Deze regio van Europa staat ook wel bekend als het Middelands Zeegebied. 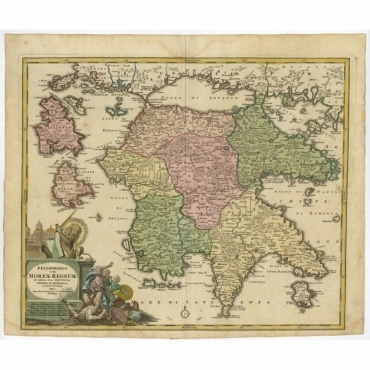 Onze collectie antieke kaarten van Zuid-Europa bestaat uit antieke kaarten van Griekenland, antieke kaarten van Spanje, antieke kaarten van Portugal, antieke kaarten van Italië, antieke kaarten van Turkije, antieke kaarten van Cyprus en andere regio's van Zuid-Europa. 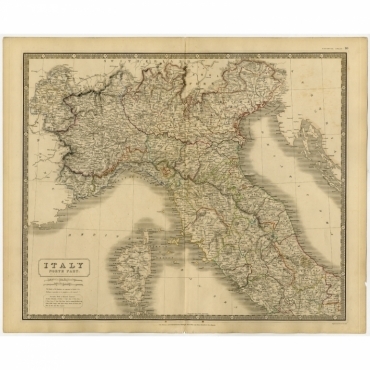 Antique Maps | South Europe There are 85 products. 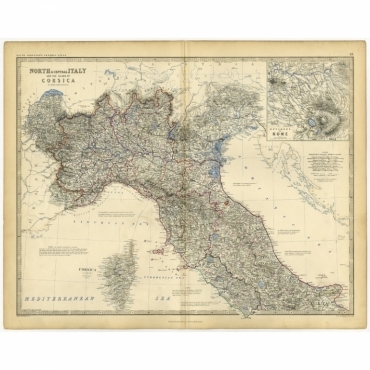 2 Antique prints, titled: 'Italy North Part. & Italy South Part.' 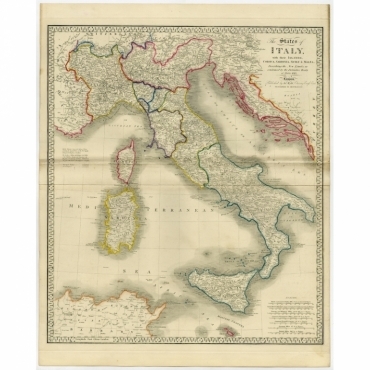 - 2 Maps of North & Central Italy and the Island of Corsica and a map of Southern Italy and the island of Sardinia. 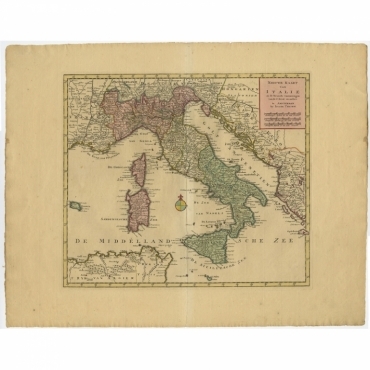 Antique print, titled: 'The States of Italy, with their islands, Corsica, Sardinia, Sicily & Malta, describing the new limits as confirmed by the definitive treaty of Paris 1815.' - Large map of Italy. 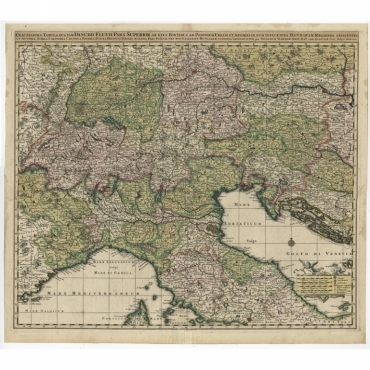 Antique print, titled: 'North & Central Italy and the Island of Corsica.' - Map of North & Central Italy and the Island of Corsica. With an inset map of the Rome region (Environs of Rome). Antique print, titled: 'Mappa Corografica do Reino de Portugal. 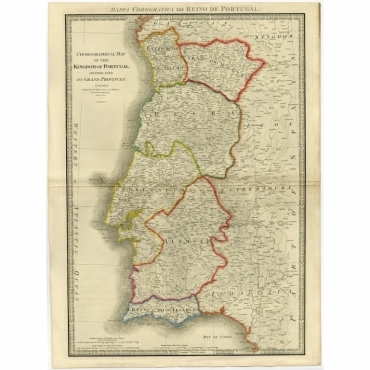 - Chorographical map of the Kingdom of Portugal divided into its Grand Provinces.' - Large map of the Kingdom of Portugal. Antique print, titled: 'Spain & Portugal.' - Map of Spain and Portugal. 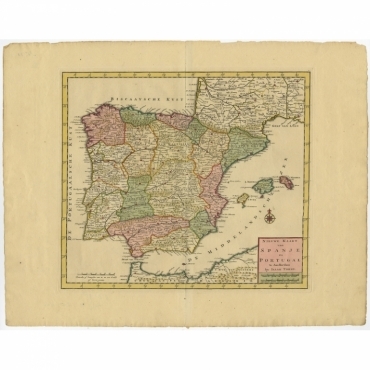 Antique Map, titled: 'Spain and Portugal.' - Map of Spain and Portugal, with the Balearic Islands (Mallorca, Menorca, Ibiza and Formentera). 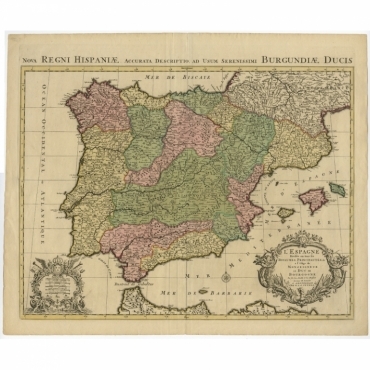 Antique print, titled: 'Bowles's New Pocket Map of the Kingdom of Spain and Portugal according to De Lisle' - Large and detailed map of Spain and Portugal. 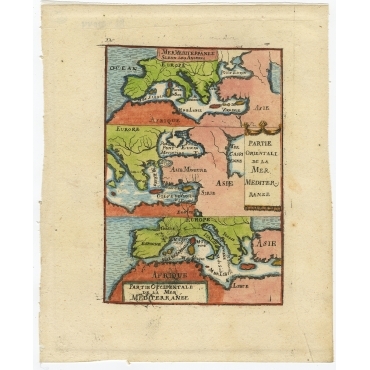 Antique Map, titled: 'Peloponesus hodie Moreae regnum in omnes suas Provincias Veteres et Hodiernas accurate divisum.' - Detailed map of the southern part of Greece including Peloponnesus, Zakinthos, and Kefallinia. Good detail throughout. Large cartouche depicting a mythical lion slaying invaders with a sword. 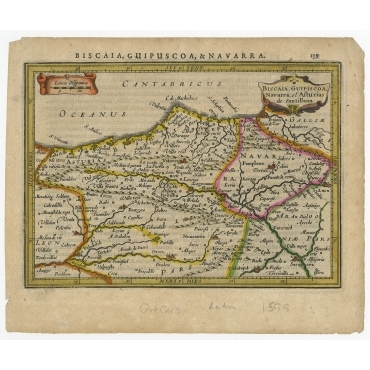 Antique map, titled: 'Plan de la Ville de Syracuse.' - Plan of Syracuse ,Sicily, Italy. Antique print, titled: 'L'Italie.' - Map of Italy, Corsica, Sardinia and Sicily. 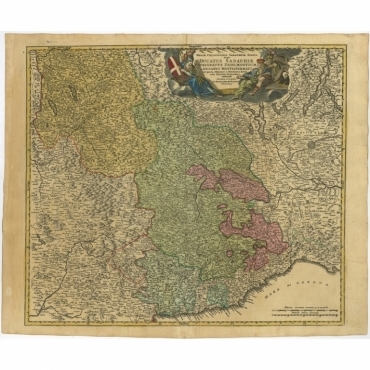 Highly detailed, showing towns, rivers, some topographical features and political boundaries. 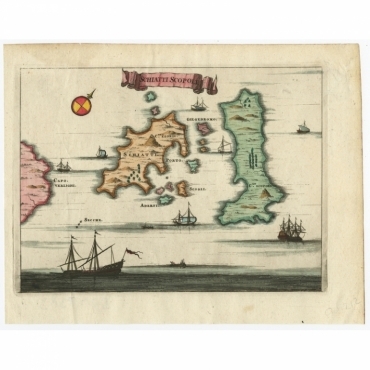 Antique map, titled: 'Sara.' 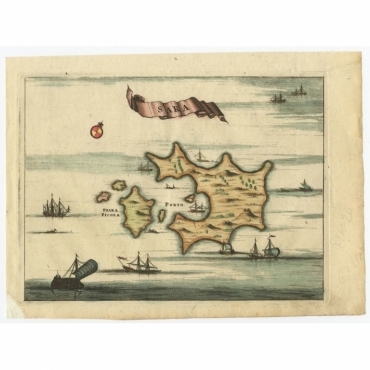 - Map of Psara ( Psyra or Ipsera) Island (North East Aegean Islands), Greece. 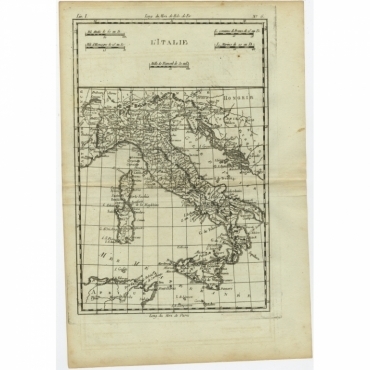 Antique map, titled: 'Schiatti - Scopoli.' 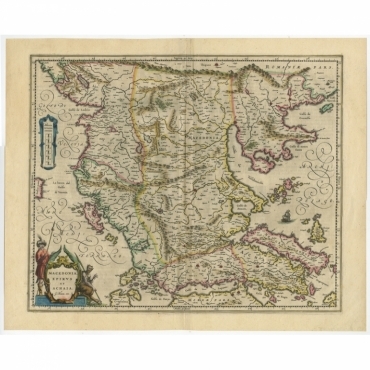 - This original antique map shows the islands Schiatti and Scopoli in Greece. 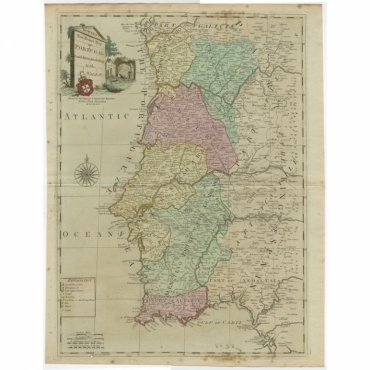 Antique print, titled: 'Bowles's New Pocket Map of Portugal, Laid Down According to the Sr. Nolin' - Large and detailed map of Portugal. With nice vignette, compass rose, key and scale. Antique print, titled: 'Macedonia, Epirus et Achaia' - Ornated with a nice allegoric cartouche, one ship and a milage scale. Macedonia is shown in the centre of the map. With many details of placenames of cities and villages, rivers, lakes and mountains are as well engraved. Verso Dutch text. Antique print, titled: 'Italia Antiqua of Oud Italje (…).' - Very decorative map of ancient Italy and the islands Corsica, Sicily and Sardinia after N. Sanson, published by Francois Halma. Antique print, titled: 'Nieuwe Kaart van Italie na de Nieuwste waarnemingen van de l'Isle en andere.' - Attractive detailed map showing Italy as well as Corsica, Sardinia, Minorca, Croatia, Albania, Dalmatia, a bit of Provence, Malta and the northern coast of Africa. The map is centered on a simple compass rose. Antique print, titled: 'Nieuwe Kaart van Spanje en Portugal.' 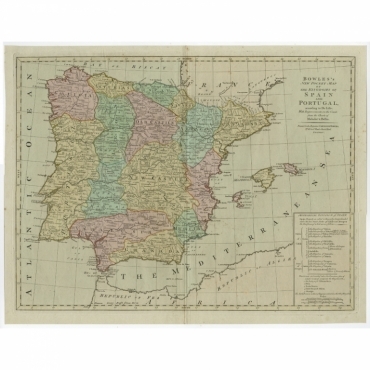 - Attractive detailed map showing Spain and Portugal. Including Majorca, Minorca and Ibiza. Title in block-style cartouche with a simple compass rose. Antique print, titled: 'Lero, Calamo, Zanara e Levita, Amorgo.' 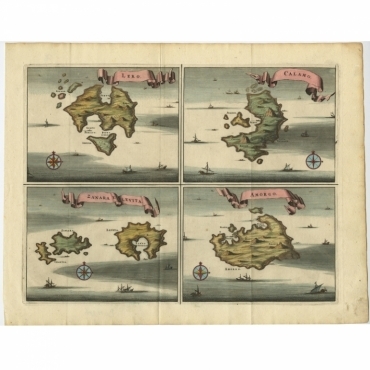 - Sheet with four maps on one page showing the islands Lero, Calamo, Zanara e Levita annd Amorgo, Greece.